Hero Kim Jae Joong of JYJ is crowning champion as the most liked singer actor in the “Who Are Your Favorite Idol-Turned-Actors” online pool conducted by MTV K.
Recently, many idol singers are extending their entertainment antenna to drama series, and participated in the acting of many drama series. Other than providing insight into the excelling singing, at the same time showing the stellar acting talent. For this reason, MTV K specially conducted a three-day online poll event, to investigate who is most idol singer who is most welcomed by netizens and successfully in the acting challenge. In the end, JYJ’s Kim Jaejoong is gaining 44.1% of support through his natural acting in Protect the Boss, crowning the first place. 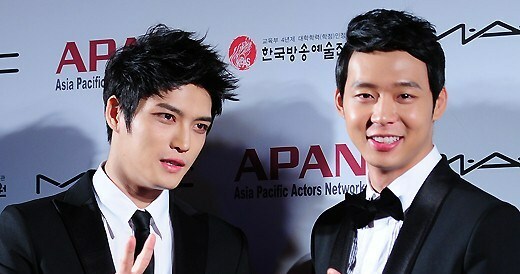 Another member of JYJ, Micky Park Yoochun is in hot pursuit at second place with his films Sungkyunkwan Scandal and Miss Ripley, getting support of 26.2% netizens. Ranked third with 21.9% support is U-Know Jung Yunho Choi of DBSK (TVXQ) who acted in Poseidon. Others including 2PM’s Ok Taec-Yeon, Super Junior’s Choi Si Won, and SS501’s Kim Hyun Joong were also receiving support from netizens, making it to the list.